Thanks to everybody who took the time to send us an email to draw our attention to mistakes and typos in the book. We thank our readers for reading the book so carefully and attentively that you could spot the flaws. Thanks a lot! Below is a list of errors that have have been identified in the first printing. All of these errors should be corrected in the second printing. Feel free to send us email as soon as you detect another mistake. that is, seven dots followed by the three digits representing the value of i , followed by the character sequence contained in s .
The stream state affects the behavior of the IOStreams operations. By convention, all IOStreams operations have no effect once the stream state indicates an error situation. More specifically, I/O operations do nothing if the initial stream state at the time of their invocation includes either failbit , badbit , or eofbit , and input and output operations stop as soon as one of the stream state flags is set. Note the interesting effect of the eofbit : Extractions do not only stop in case of an error ( failbit or badbit ), but also when the end of the input stream is reached ( eofbit ). Insertions typically stop only in case of an error, because no output operation ever sets the eofbit . If, however, the eofbit has been set before the output operation is invoked, then the attempted insertion will fail and have no effect. This can happen in bidirectional streams when an extraction that reached the end of the input is followed by an insertion to the stream, which then has the eofbit set due to the preceeding extraction. For this reason the eofbit in addition to the error flags failbit and badbit stops operations on input and bidirectional streams, but is irrelevant for operations on output streams. The cast operator operator void*() returns a zero pointer value if failbit or badbit are set, and zero otherwise. The call to cout .exceptions(ios_base::goodbit) clears the exception mask and deactivates all exceptions. All of the subsequent statements are executed because no exception can be thrown. Eventually, the call to cout .exceptions (ios_base::badbit | ios_base::failbit) is wrapped into a try block and raises an ios_base::failure exception in case that any of the previously executed operations failed. THE INITIAL FILE LENGTH . The open mode trunc (meaning truncate ) sets the initial file length to zero, which has the effect of discarding the file content. The trunc flag is included in the default open mode of output file streams, so you can omit the trunc flag and think of the open mode out as being equivalent to out|trunc . This only holds true for output file streams. For bidirectional file streams, the trunc flag must always be explicitly specified, i.e., you must say in|out|trunc , if the file content is to be discarded. The equivalent operation in C would be a call to the sscanf() function. However, string streams are more powerful than sscanf() , because they use the full set of formatting facilities of IOStreams, including internationalization for instance. while (cin.getline(buffer, line_buffer_size, '\n') // stream still good() ? || cin.gcount()) // any characters read ? The error handling is omitted from the example. The functions tellp()/tellg() indicate failure by returning the invalid stream position pos_type(-1) and seekp()/ seekg() indicate failure by setting the stream state. where sync_with_stdio() is a static stream member function defined in base class ios_base . 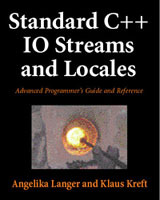 After such a call the predefined streams will operate independently of the C standard files, with possible performance improvements in your C++ stream operations. In diagrams change basic_streamout to basic_streambuf . Mind the difference described in the preceding chapter between the base class version of rdbuf() and the hiding version in the concrete stream classes. The base class version returns the stream buffer object referred to by the stream buffer pointer; the derived class version returns a pointer to the embedded stream buffer object. After resetting of the stream buffer pointer, both are different. Astute reader Robert Goddard comments: The phrase "both are different" is ambiguous: different from one another (true), or both are different from their previous values (false)? I suggest the phrase "the result of a call to the base class's rdbuf() has changed but the result of a call to the concrete class's rdbuf() has not." Or, since you have spelled it out elsewhere, you may choose to shorten it to "the results of calling the two rdbuf() functions differ from one another." Mind the difference described in the preceding chapter between the base class version of rdbuf() and the hiding version in the concrete stream classes. The base class version returns the stream buffer object referred to by the stream buffer pointer; the derived class version returns a pointer to the embedded stream buffer object. After resetting of the stream buffer pointer, the results of calling the two rdbuf() functions differ from one another. Class basic_streambuf<class charT, class Traits> is an ”abstract” base class in the sense that no instances of this class can be constructed. Its constructor is protected and hence accessible only to derived classes. If the put area exists and it is not already full, i.e. next_pointer != 0 and next_pointer < end_pointer, then the character is put to the position the next_pointer is referring to, and the next_pointer is incremented. If the get area exists and characters have already been read, i.e. next_pointer != 0 and begin_pointer < next_pointer, then a putback position is available. Invocation of erase_event callback functions on calls to copyfmt() is useful because copyfmt() overwrites the original data members of the stream object. The example in section 3.1.4 , Refined Inserters and Extractors, demonstrates the correct use of sentries. A concrete example is shown in section 3.1.4 , Refined Inserters and Extractors. Some of these aspects are demonstrated in the example presented in section 3.1.4 , Refined Inserters and Extractors. The inserters and extractors presented in section 3.1.5 , Generic Inserters and Extractors, are another demonstration of the principle. Ignore the footnote on page 156. We initially had no intent to discuss format control parameters, but decided later that the example would be incomplete without it and added a section on format control (see section 3.1.4.3). For this reason the footnote is obsolete and should be removed. The section below might be slightly misleading. We did not mean to suggest that the C++ standard requires dates before January 1, 1970 to be unrepresentable. mktime() also flags date values that cannot be represented in a tm structure, such as dates before January 1, 1970. The C standard states that a conforming implementation of the C library is required to document its choice of range and precision of times representable in time_t. In all implementations that we know of the valid range starts with January 1, 1970. In other words, whether or not a date before January 1, 1970 can be represented is implementation-defined. Suggested improvement: add a footnote. * The range of times representable in time_t is implementation-defined. In many implementations of the C library dates before January 1, 1970 cannot be represented. The sample code is a simplification of the truth: The leap-year rule in date::valid() is a little off. For example, 1900 wasn't a leap year and 2100 won't be. We were deliberately trying to keep the algorithm simple, because the focus of this section is on error indication in inserters and extractors rather than leap-year algorithms. * The leap-year rule in date::valid() is simplified For example, 1900 wasn't a leap year and 2100 won't be. Consequently, setting the format string to "%Y" has no effect. Again, the error handling in underflow() is oversimplified in that it always returns traits_type::eof() to indicate failure, regardless of the source of the error. The virtual member function showmanyc() (pronounced “ess-how-many-see,” not “show-manic”) returns an estimation of the number of characters available for input, or -1 . If the returned value is positive, then at least the indicated number of characters can be made available by one or more calls to underflow() . If the operations returns -1 , calls to underflow() and uflow() will fail. The intent is not only to know in advance that these calls will not return traits_type::eof() , but that they will return “immediately.” Or, to put it more simply, the purpose of this operation is to check if characters are available on the external device, which can be read by underflow() or uflow() without waiting. The example of a Greek date format is slightly incorrect: The iota used in the name of the day and the name of the month must be accented using the Unicode character 03AF. Click here for the correct format using ISO-8859-7 character encoding. The reference returned remains valid at least as long as any copy of the containing locale exists. Section 7.3 , Memory Management of Facets in a Locale, explains why this is and how it works. To be more precise, we should say that in every locale there is one representative of each standard facet family. Remember, we mentioned before, at the beginning of chapter 5 , that facet types are organized in facet families, that is, hierarchies of facet classes derived from each other. The C++ standard describes how message catalogs can be accessed via the messages facet’s member functions. The section header "Formatting and Parsing Facets" can be misunderstood as talking about formatting and parsing of facets, while we actually talk about "Facets for Formatting and Parsing". Change section header on page 286, in the table of contents on page ix. If the last integer is <= 0 or == CHAR_MAX , the described group is unlimited. In Nepal, on the other hand, the first group has three digits and all subsequent groups have two digits, so that the same number, 10 million, is formatted as 1,00,00,000. This grouping is described by a two-element string, where the first element is 3 and the second 2. Please note that an empty string and a string that contains a single 0 describe the same grouping. For formatting of the numeric value, the put() function takes into account the information contained in numpunct, which is obtained from the locale returned by fg.getloc() , the format flags contained in the ios_base object fg , the fill character fl , and the character classification information taken from the ctype facet contained in the locale returned by fg.getloc() . with the format character x .
Inthe diagram the occurrence of ctype_byname<wchar_t, char, mbstate_t> must be replaced with codecvt _byname<wchar_t, char, mbstate_t> . Note that every instantiation of numpunct for a different character type introduces another facet family with its own facet identification. numpunct<char> has the identification numpunct<char>::id , and numpunct<wchar_t> has the identification numpunct<wchar_t>::id , which is a different static variable with a different value. The derived class numpunct_byname<char> shares the identification numpunct<char>::id with its base class numpunct<char> , and numpunct_byname<wchar_t> has the identification numpunct<wchar_t>::id of its base class. More about the dynamic cast can be found in section G. 8 , Dynamic Cast, in appendix G.
use_facet() will find a facet with the facet interface identification base_facet::id in the locale object loc , and the dynamic cast to const base_facet * will be processed successfully, because the facet is of exactly the required type. Locales are designed for being passed around by value. As we have seen in the previous section, internally a locale is nothing more than a handle for a container of facets. As a result, copying and assignment of locales are relatively inexpensive and you can safely pass a locale to a function by value (rather than by reference) without risking substantial overhead. See sections 6.3.1.2, The Derived Byname Facets , and 5.1.1, Named Locales, for details about these locale names. streamoff is an implementation-defined type which can be constructed from an integral value, can be converted to an integral value, and allows checks for equality and inequality. Usually it is a typedef for one of the signed basic integral types. streamsize is an implementation-defined type which is a typedef for one of the signed basic integral types. In general it is used to represent the number of characters transferred in an I/O-operation, or the size of an I/O-buffer. There is an open issue in the C++ standard regarding the behavior of getline() in case of failure. In the book we write that the character buffer is zeroed out on failure, that is, when the sentry returns false or the sentry constructors throws an exception. The standard does not explicitly say so. An alternative interpretation is that getline() will NOT store a null character in case of failure. Both approaches (storing a null character and not storing it) exist in current implementations. Those implementations that do store a null character on failure only do so when the sentry returns false, but do not store it if the sentry constructor throws an exception. attempting to obtain any input. In either case the number of extracted characters is set to 0 and the function's argument is left unchanged." "If the sentry constructor exits by throwing an exception or if the sentry object returns false, when converted to a value of type bool, the function returns without attempting to obtain any input. In either case the number of extracted characters is set to 0; unformatted input functions taking a character array of non-zero size as an argument shall also store a null character (using charT()) in the first location of the array." Constructs an object of type basic_ios<charT,traits> leaving its data member uninitialized. The object must be initialized by calling its init() member function. If it is destroyed before it has been initialized the behavior is undefined. - this-> iarray and this->p array are null pointers . Repositions this to the location designated by pos , by calling this->rdbuf()-> pubseekpos(pos) . Failures are indicated by the state of *this . Returns *this . Repositions this to the location designated by off and dir , by calling this->rdbuf()-> pubseekpos(off,dir) . Failures are indicated by the state of *this . Returns *this . If this->fail()==true , returns pos_type(-1) . Otherwise gets the stream positions by calling this->rdbuf()->pubseekoff(0,ios_base::cur,ios_base::out) and returns the result from this call. Stores the character c in the put area, e.g. (*pptr()) = c . If the put area does not exist or is full ( i.e. pptr()==0 || pptr()==epptr() ), this->overflow() is called and the result of this call returned. If a putback position is available (i.e. gptr()!= 0 && eback()<gptr() ), the next pointer of the get area is decremented and the element the next pointer is now pointing to is returned. The element is converted to int_type before the return. Otherwise calls this-> backfail() and returns the result of this call. Calls this->xsputn(s,n) and returns the result of this call. Writes n successive characters beginning with (*s) to the put area. It behaves like repeated calls to this->sputc() . Writing stops when either n characters have been written or a call to this-> sputc () would return traits_type::eof() . The functions returns the number of written characters. Returns the end pointer of the put area. Returns the begin pointer of the put area. Returns the next pointer of the put area. Returns the begin pointer of the get area. Returns the end pointer of the get area. Returns the next pointer of the get area. Allows an object of a derived class to be informed that the locale of this has changed, by overwriting this function in the respective derived class. basic_streambuf <charT,traits>::imbue() does nothing. If ct is the radix separator, i.e., ct == use_facet< numpunct<charT> >loc. decimal_point () , the related character is set to '.' . The entries for seekp, seekg, tellp, and tellg must be corrected.